You know that your credit score is important—it’s a number that lenders use to determine whether they should offer you credit, and what interest rate you qualify for. Whether it’s a credit union, a credit card company, or a car dealership, these lenders will look at your credit report to learn how you’ve managed your finances in the past. After all, they want to be sure you’ll repay your loan on time. In other words, your credit score helps lenders determine the level of risk involved if lending you money. Your credit score isn’t the only thing a lender wants to know about you. There are other aspects of your credit report that are important, such as your total amount of debt, any derogatory items on your report, and the types of credit accounts you have—both present and past. Your payment history. Your credit score will reflect the on-time payments you make as well as late or missed payments. Payment history is the most highly weighted factor used to calculate your credit score. Credit utilization ratio (capacity). This compares the total amount of credit you’re currently using with the total amount of credit you have available. For the best credit score, you want to keep your balances less than 30% for each account. For example, if you have a credit card with a $10,000 limit, be sure to keep the balance for that card below $3,000. Total debt. This is the sum of all of your debts, including loans, collections, credit cards, and other credit accounts. Credit mix. This looks at the different types of credit accounts you’re using (such as a mortgage, an auto loan, a credit card, store credit, etc.). Account age. Lenders want to see an established history with on-time payments — and how old your credit accounts are is important. Hard inquiries. When someone runs a credit check on you, this is known as a hard inquiry. Public records. This can include tax liens, bankruptcies, or civil judgments. Credit is an intricate subject, and to further complicate matters, you might be surprised to learn that you have not only more than one credit score, but you also have more than one type of credit score. 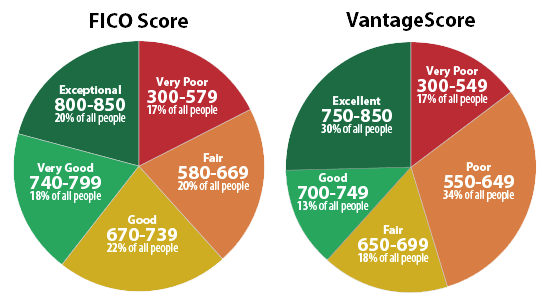 FICO and VantageScore are two popular credit scoring methods. They each use different algorithms to calculate credit scores. In addition to the two credit scores we’ve already discussed, you also have a distinct credit score with each of the credit reporting agencies: Equifax, Experian, and TransUnion. Your credit score with each of these agencies is likely very similar; however, it is possible there may be some discrepancies. For example, I paid off my car in 2015. TransUnion and Experian show the loan as having been paid off, but Equifax didn’t update the information on the loan after it was paid off and the account closed, so that debt still appears on my credit report. In this case my Equifax credit score would be lower than the scores from TransUnion or Experian. Additionally, there are specialized credit scores that lenders use for specific types of loans. For example, if you’re applying for a car loan, a lender will look at your Auto Enhanced score—this type of score gives more weight to how you’ve paid previous auto loans. In other words, if you paid your mortgage and credit cards payments in full and on-time yet your car loan payment was always late, that would be reflected in your Auto Enhanced score. Keep track of your credit score. Regardless of whether you use a free service like Credit Karma or pay for a subscription like MyFICO, regularly checking your credit report can help you discover mistakes or fraud. We recommend checking your credit report at least twice a month. This way, you can take action if you notice something out of place. Since clearing up discrepancies on your credit report can take months in some cases, you’ll want to deal with any issues as soon as possible. Learn which credit score your lender uses, and then focus on that score. For example, let’s say you are looking for a personal loan. Ask your lender which credit score they will use before you apply for the loan. If you find out they use the Beacon score, you’ll know to look at your Equifax score. Ready to start the real estate loan process? Our Personal Bankers can assist you with any additional questions you may have regarding credit scores and their importance for your real estate loan. Please call 512-874-7171 or click below to get started today!